The Public Health Garden at the University of Maryland, College Park, is a student teaching and community garden demonstrating sustainable agriculture and environmental best practices in support of public, environmental and community health. This blog will follow our adventures designing, implementing, maintaining, & enjoying the garden. Brendan Chareoncharutkun, one of the Public Health Garden's own, has been studying Permaculture at Tacome Pai Organic Farm in Thailand this summer and touched base with us from "the land of smiles" to see if we could help promote the fundraising campaign for Tacome Pai's sister project: The New Land. They've got until September 30th to raise the remainder of the $5,200 fundraising goal. 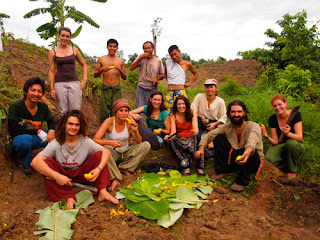 With that funding, they aim to revitalize 72,000 square meters of deforested and degraded land by applying Permaculture design principles. The long-term mission of the project is to demonstrate and reintroduce sustainable living techniques to the locals and to create a prototype for reforestation and sustainable livelihood projects all over the world. Read more here and please join us in making a pledge. If you haven't had a chance to peek down the hillside and see what the Public Health Garden student group has been building and maintaining, stop by soon! The cukes are climbing, the tomatoes are staked and irrigated, the apples are filling out, the bio-retention area is flourishing, and all the seeded and transplanted flowers are in bloom. Thanks to dedicated garden planner Phil Capon, the tomatoes, okra, peppers, cukes and squash on the hillside are easy to water and happy as can be! To find out what else is new in the garden, check out our facebook and flickr pages. Our most loyal and precocious feathered friend named after one of our favorite spring veggies. Kohl-Robin gets a little shy when the camera comes out but for the most part frolics right alongside our hillside cultivators. 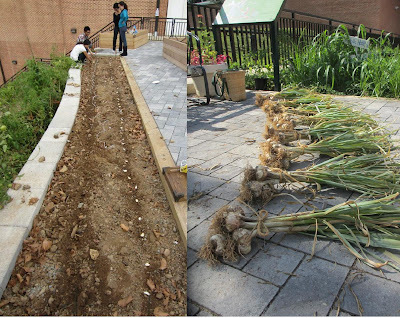 While our new garden planner, Phil Capon, was planning and planting plots on the hillside, our new garden manager, Nathan Lim, harvested about 70 heads of garlic from the half-built bed on the terrace. The cloves were planted during the First Annual Harvest Festival in October 2011 and despite the less-than-ideal soil and nutrients available at the start, months of careful nurturing with soil amendments (like composted lobster shells and organic fish fertilizer) appear to have paid off. Want to see what happens next? How garlic is cured? Stored? Used in cooking? Follow the story of our garlic on Allie and Deb's new website Compost2theMoon.com - scheduled to go live next week! After a lovely and productive meeting with students, faculty, staff and advisers associated with the Public Health Garden past, present and future, we spent an equally productive afternoon doing maintenance on the hillside. We managed to squeeze a few dozen more Zinnias, Bachelors Buttons and Four O'Clocks into our flower patch, find and clear soil space for eggplant, cucumber and squash transplants, and start implementing the vision of our new community garden planner, Phil Capon. We also had an opportunity to share extra plants with gardeners, friends and supporters in the College of Agricultural and Natural Resources. During our time on site we noticed this fantastic example of adventitious roots on one of the Institute of Applied Agriculture's container-planted tomatoes and the stabilizing qualities of these roots beg a comparison of the future of the garden itself. Adventitious roots arise from different parts of the plant - like the stem and branches - than traditionally develop from the primary root (apical meristem). In the case of tomatoes, adventitious root growth can be encouraged by burying a few inches of the stem beneath the soil during a transplant and will strengthen the plant by giving it a wider foundation for support. 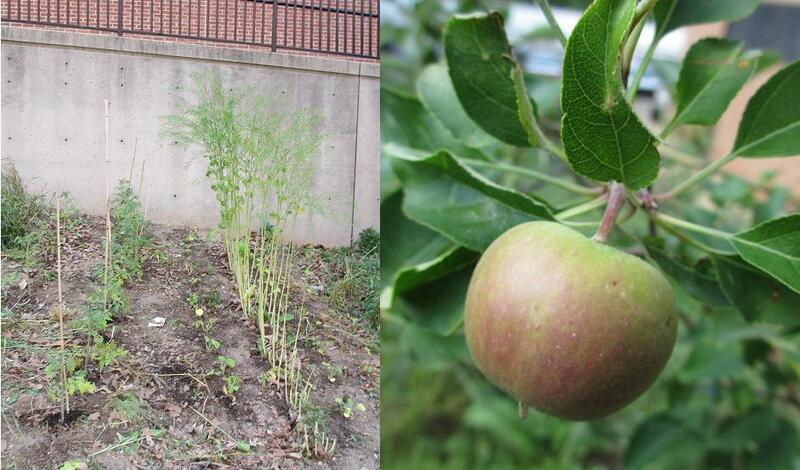 The Public Health Garden began as a seed - an idea and a grant - that with the right mix of sunshine, soil, water and attention turned into a strong, lively, and quickly-growing plant with supportive adventitious roots popping our all over the place! As those roots have taken hold across campus in Facilities Management, the Student Club, the Institute of Applied Agriculture, the School of Public Health, Campus Recreation, the Wellness Coalition, the Office of Sustainability, the Arboretum Outreach Center, the dream of the garden continues to grow stronger and more sustainable each and every day. While the teaching, demonstration and community space on the top patio is looking fabulously green and exploding with happy plants, the hillside could use a little TLC in the next couple of weeks. While we have intentionally allowed many cover crops to go to flower and attract beneficial insects, we have been keeping a close eye on pests and pulling invasive and problem vegetation with a quickness. Last week, we discovered a few rogue tomato plants and cosmos that had self seeded and popped up through the vetch and grasses. Since we've got a few months before formal construction on the next phases of the garden, we're going to go ahead and plant a few things in the flattest areas. So far we've put in a flat of pumpkins (courtesy of our friends at the St. Mary's Garden Club) and some Sungold Cherry tomatoes. The areas of the hillside just below the top patio are growing dense with parsley and sprinkled with a few happy apple trees. Closer to the base of the hill, we've got some strong strawberry plants and berry bushes. All these hidden treasures could use a little help in terms of clearing weeds from the immediate areas around them so if you are hanging out this summer and looking to break a sweat, stay tuned to the blog for additional volunteer sessions and plantings. Right now we are looking at getting an early start this Thursday May 31st at 2:00pm.